Knife Sharpening ~ Free for our Sisters! Laurel and I visited our friends Reno and Debra DeGianni yesterday at Stuffers Supply Co. at their brand new warehouse. Debra toured us around and introduced us to the new knife sharpening service that they are providing. Laurel and I brought our dull knives in and Debra got them nice and sharp and ready for action in our kitchens! Debra toured us around their beautiful brand new facility and sharpened our dull knives for us! If you like nice things, then you’ll love sharp knives. Our friends at Stuffers Supply Co. have been supplying knives to professional butchers for almost 2 decades. They specialize in sausage-making supplies (hence the name), but if you want sharp knives – and who doesn’t – they have the expertise. Bring them your dull, frustrating knives and they will have them sharpened up for you just in time for all of your kitchen prep for holiday entertaining. 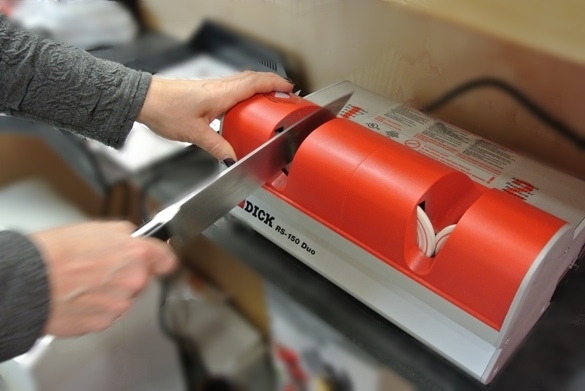 How often should you get your knives sharpened? The reason that knives get dull is that the blade bends as you cut or chop. To keep knives in good condition, they really should be sharpened every couple of months. As a rule of thumb, sharpen your knives with the change of the seasons. The exception to this would be if you maintain them yourself with a sharpening steel, but you would need to sharpen them either before or after each use and then sharpening would probably be required just once a year but realistically most people don’t have the time to do that. If you could recommend one knife that should be in every kitchen, what would it be? Reno favors a cimeter steak knife by Victorinox. It’s a rather large knife but is very versatile. 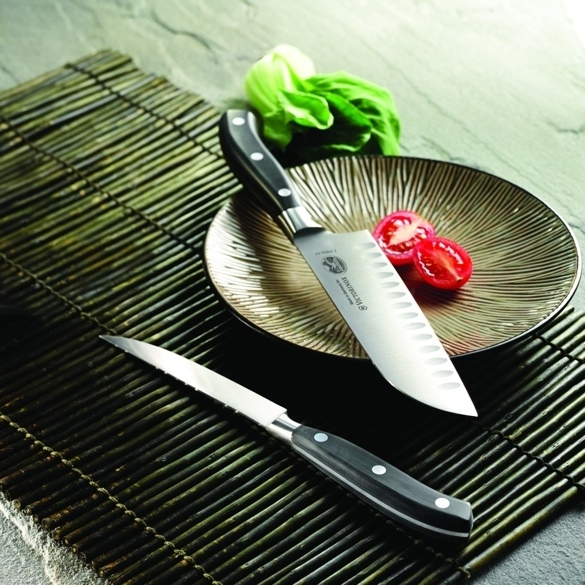 Debra recommends the santoku, which is a Japanese style all purpose chef knife, by Victorinox. The top knife is Reno’s pick…a cimeter. They start at around $70. The bottom knife is Debra’s pick….a santoku. They range from $50-$99. What is the best surface to chop or slice on for your knives? Wood is the best for your knives, however, people do worry about bacteria. Plastic is second best and can be disinfected in the dishwasher. Marble and glass are the hardest on your knives. What is the best way to store your knives? We are all guilty of just tossing them in the utensil drawer, but the best way to protect your knives is to store them on a magnetic bar. Here’s some fantastic news for all of our readers…..
Stuffers is offering FREE sharpening for our Sugarplum Sisters followers for the remainder of November and all of December! Simply “like” Sugarplum Sisters on Facebook (click here), take in up to two knives, mention “Sugarplum Sisters”, and they will be happy to make them sharp for you at no charge (maximum 2 knives sharpened free of charge from Nov. 15-Dec. 31/12 per person). You may also enjoy a 10% discount on any purchase you make in the store. 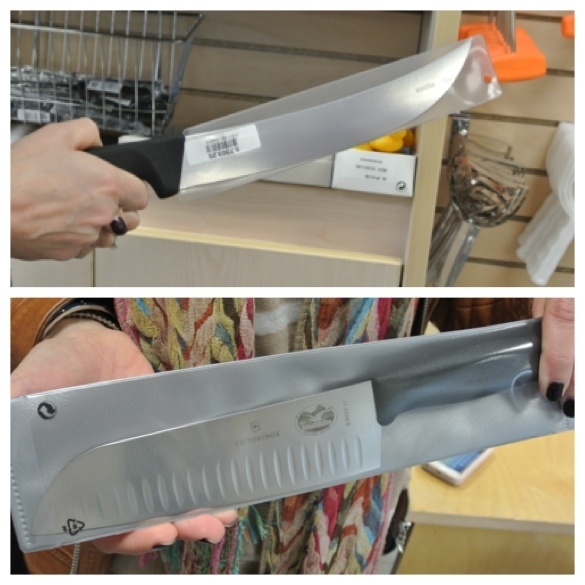 You’ll want to check out their selection of knives, spices, electric slicers and more! Please show Stuffers some love and “like” them on Facebook (click here). Sharpening the knives is a two-step process but it only takes a couple of minutes. We love all of the extra little touches at Stuffers…they really go the extra mile! Debra wrapped up treats for Lo and I in twine imported from Germany. We love these labels she put on our sharpened knives! Go to Stuffers Supply Company at 22958 Fraser Highway in Langley. They are just west of 232nd Street on the south side of the road. Their old building sits empty in the front, but drive past that to their brand sparklin’ new warehouse and showroom in behind. « Stella and Dot Giveaway ~ Winner!